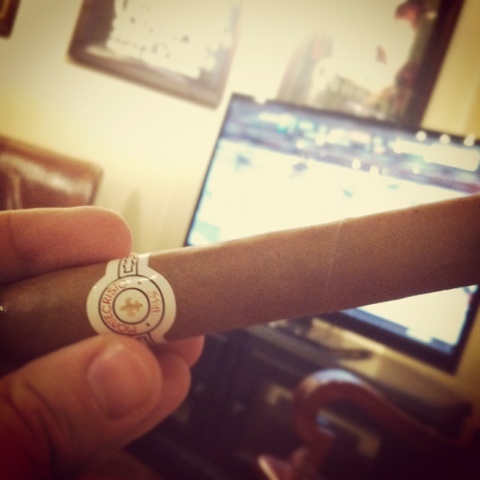 Appearance (0-20): As is standard with most Montecristo cigars, I had no real complaints with the way the cigar looked. No visible blemishes or veins were present and the wrapper looked to have some nice aging on it. The wrapper was silky to the touch. The label was the standard for Montecristo – simple but elegant. Construction (0-20): Again no complaints at all with the construction. The cigar lit up with ease and was nothing but enjoyable throughout the stick. It burned relatively evenly and had a very nice draw to it. The cigar itself felt firm, but wasn’t overpacked in any way. Strength (0-20): From all of the reading I have done on this cigar, it’s supposedly the medium to full range. I was hoping for something more on the full side of things, but it was absolutely a medium bodied cigar. Regardless, the heft of the cigar was pretty spot on for what it was. Flavor (0-20): This is where the meat and potatoes of this cigar really lie. The cigar began very smooth and mellow with a nice wood taste to it. But once you were through about a third of the cigar the flavors melded into something more – pepper and cream. The pepper was very understated while the creamy nature took center stage, leaving a delicious taste on the tongue. When I hit the last third, I found that the flavor almost evened out between the cream / pepper and wood tastes. It was a little heavier at this point, but still in the medium range. I absolutely enjoyed the creamy complexity this cigar put forth. Value (0-20): The pricepoint of $7.50 a stick isn’t a bad one, but it also isn’t something I would be running out the doors to buy up as many as I can. I would say its likely appropriately priced and could be viewed as a slight bargain depending on your spending habits. Additional Notes: No drink pairing for this one other than some water. The cigar was smoked at CI, where the climate is always right and the people are always… interesting?